Revel in me...: Grad Mad. Today was my university's convocation day, hence, the lawns of the campus were filled with hopeful graduates, all brimming with pride under their black cloaks. Erm, I have no idea what you called the standard cloak thingy that all graduates are obligated to wear, so I'll just refer to it as a cloak. 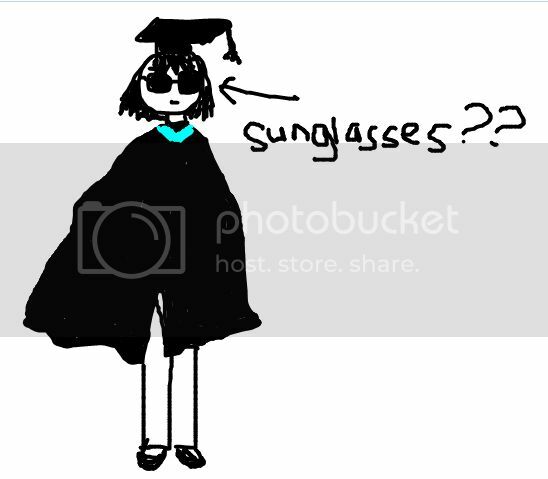 The black hat, the black sunglasses, the black coat, appealing it is not. haha... but no one can see your dress! Hey Dear, read ure post on my blog...sorry didnt email, figured you'd this first..Istill dont have internet at home *blergh* and in the midst of exams, so super super busy...will be free from 1oth!! Had my med ball yesterday..will post up pics soon okay..till then take care, and good luck for ure exams!! I'll email u asap!